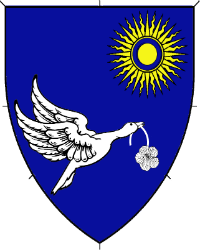 Azure, a goose volant bendwise sinister wings addorsed maintaining in its bill a nasturtium argent, in sinister chief on a sun Or an annulet azure. Name registered with the College of Arms in September 2014. Device registered with the College of Arms in April 2015.